Teeth endure extreme conditions every day: over 600 different bacteria, intense pressure, and dramatic temperature variations, just to name a few. Still, a smile can look very friendly and sweet. People see your smile and automatically, a first impression is formed. Can you imagine what life would be like if instead, you had no teeth? Your diet, health, confidence, and even your entire life would change. Fifty-million Americans are already in that situation. Don’t become a statistic as well! The replacement tooth option that most closely mimics nature’s original design is the dental implant. An implant consists of a false tooth (crown) and false tooth root (post). In comparison, bridges, partials, and dentures don’t offer replacement tooth roots. Instead, these prosthetics rely on existing structures to support and secure the replacement teeth. Dental implants stand alone, anchored by the replacement for the missing root. Furthermore, dental implants can secure one or more missing teeth. 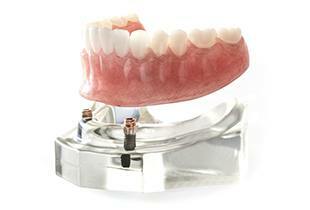 One implant can hold one crown, or a few implants can hold a bridge, partial, or denture. Why is replacing teeth so important? If you’re missing one or more teeth, your remaining teeth must compensate by bearing the workload. This is why remaining teeth are at a higher risk for loss if the missing tooth isn’t replaced. To bear the load, they often shift out of place, and this alters your bite (occlusion), which can lead to TMJ disorder, premature tooth wear, and bruxism (grinding or clenching teeth). Because they’re placed into the jawbone, dental implants promote jawbone retention as well. Without this stimulation, the bone deteriorates, which can lead to facial deformity and an aged appearance. What are implant-retained crowns and bridges? Once your new dental implant or implants has been successfully inserted into the jawbone, it will be time for Dr. Canzoneri to start designing the ideal restoration. 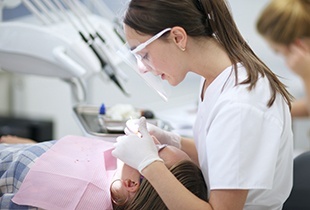 There are several options available, and his recommendation will be based on the number of teeth that need to be recreated, as well as the patient’s own personal preferences. For instance, if a single tooth/implant needs to be rebuilt, an implant-retained crown is the ideal option. This crown will be crafted from gorgeous, all-porcelain materials and fitted in place between natural teeth. Alternatively, if two or more natural teeth in a row have been lost, an implant-retained bridge could be best. This type of prosthetic will be anchored over two implants that have been placed on either side of the gap. The final result will be fixed in place for maximum oral function and security. Many patients incorrectly believe that dental implants cannot be utilized for more extensive cases of tooth loss, but this isn’t the case. Dr. Canzoneri offers implant-retained dentures as a reconstructive option that is often more cost-effective than crowns or bridges, as we will only place a small number of dental implants to support the full prosthetic. Implant-retained dentures come in two major forms: hybrid dentures and overdentures. Hybrid dentures are permanently fixed in place and can only be removed by Dr. Canzoneri; they will function just like your natural teeth. 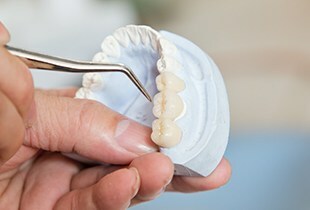 Alternatively, overdentures may be ideal for patients who have been already been wearing traditional dentures and prefer being able to take their prosthetic out when they need to. 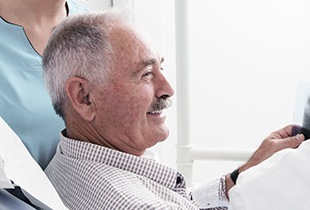 Patients will be able to reap the lasting health benefits of placed dental implants while still enjoying the convenience of a removable denture. If you’d like to find out whether dental implants are right for your situation, schedule an implant consultation with Dr. Canzoneri. He’ll be happy to assess your oral health and recommend options for replacing your missing teeth. We want you to enjoy an enhanced quality of life! At our Los Angeles dental office, you can request sedation dentistry for comfort and peace of mind during implant procedures. If financing is a concern, ask us about CareCredit, a leader in low and no-interest medical loans.